Wowser! Talk about a long time coming, but back in the dawning days of this crusty ‘ol blog I opined that I’d really like to finally have a copy of this record. I’d only seen the video in 1984 once or twice [though I’d taped it one of those times]. But 1984 was pre hi-fi VCR for me, so that tape was strictly mono. I’d never even heard the song in anything approaching high fidelity, much less stereo! As it turns out, the clip was directed by Bernard [“Relax”] Rose, not Tim Pope [though that was a good guess]. You may see the clip here at Rose’s website [no enbedding]. I had totally forgotten about the Hassidic Jews that figured with the lasso. Approximately a year ago, I finally found a 12″ of this bad boy for sale at a local record store. It’s taken me until now, but I’ve been going through a phase again recently of being diligent about actually enjoying the records I obsess over on this blog! If anything is not on CD it shamefully gets relegated to the margins of my existence. But lately, I have been buying and listening to vinyl rips and DLs on my iPod Touch. Ironic, right? Sure, it’s a hassle to rip vinyl and then get the tracks on there, but if I want to hear records [or DLs] in my car, where I do most of my listening, then it has to be so. This week saw me finally playing this record after 32 years of desire. How was it? For a start, it was quite a novelty to hear this one in stereo! Dubset are/were rather obscure. It’s a miracle that this got a US release as I can’t find any other releases of the “Flesh Made Word” album from whence these tracks herald from. As far as it stands now, there were no UK releases by the band. On Discogs, there is a single earlier album, credited to Grace Cale’s Dubset, of an album that in 1983 was released only in Belgium! “Flesh Beat Fever” remains a quirky Latin/Salsa/DubJazz song with the very British sounding Nicky Holland sounding quite out of place next to the riot of percussion and horns. The only concession to the dance music marketplace at the time was a hint of synthesizer and drum machine fighting for a place in the quirky mix. The LP mix was a good minute longer than the 7″ edit I’d heard on the video as my only exposure to the song. 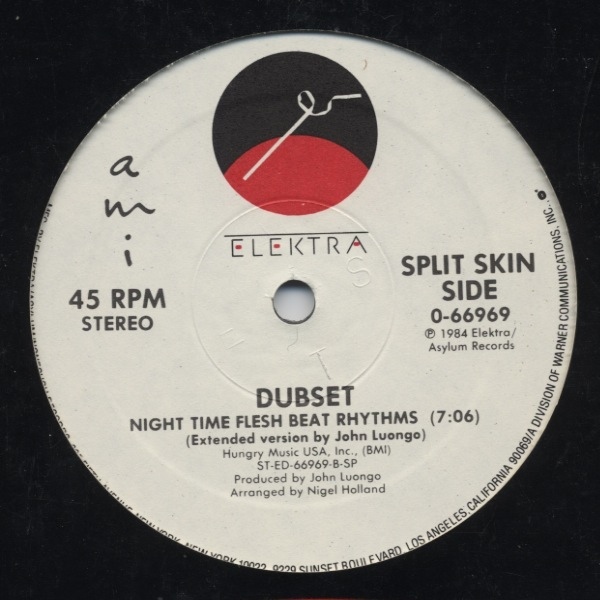 The “Night Time Flesh Beat Rhythms” mix was a 7:06 dubmix with much more drumbox and even backwards drumbox for good measure. All surrounded by congas and even a rogue quica. Hollands vocals were dubbed out to near non-existence here, but the funky Latin vibe was its own reward. I still have to pinch myself that I am right now at this minute, listening to this legendarily scarce, yet desired, record. The B-side, “Onyeocha Onyegee [white man – black man]” was another kettle of fish entirely, with Holland absent in the presence of what could only be called afro-cuban jazz! It’s all instro, but any fans of the NWOBJP that saw bands like “Blue Rondo Ala Turk” rising in profile for the cappuccino set, would find much to like here. Hearing this now makes me highly intrigued by what awaits me on the album, but it looks like I am going to have to mail order it as I’ve never seen a copy after 32 years of looking for it. As it stood, this was a great left-field record from the Post-Punk periphery that dared to walk its own path at a time when things were beginning to crash and burn in a big way in the UK pop scene for me. This entry was posted in Record Review and tagged 12" single, 1984, Dubset. Bookmark the permalink. Hi just got the album on vinyl, will let you know how it is! Nice write-up – they do seem rather obscure, yours is only info other than discogs I Can find, and only a single track on youtube. Bizarre considering they got released on Elektra label. Following your blog now! Phones Chess Club Glasgow – Welcome to the comments! Any Glaswegian is especially welcome here. Yes, it’s a damned shame that Dubset are almost as if they never existed. I have recorded the album and the 12″ single of “Flesh Beat Fever” and now need to denoise the tracks and think about the inevitable REVO CD. Perhaps in my retirement.